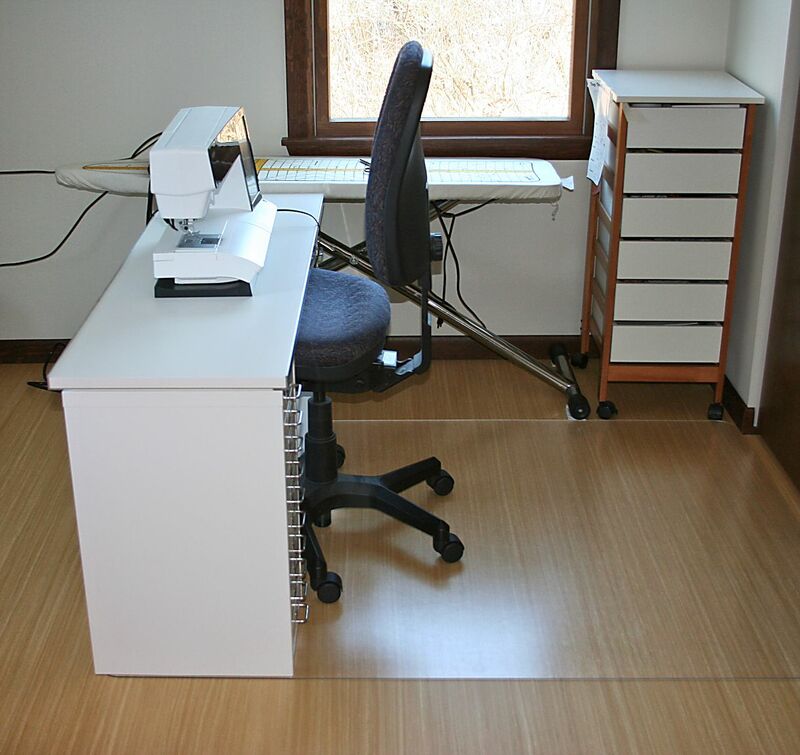 Lots to report on my sewing studio – thank goodness. It’s been close to 2 months since I’ve had access to my sewing machine, and I’ve really missed sewing. He removed hooks and patched everything to perfection, and even chipped in to help the electrician who came when I experienced a mini electrical emergency. An outdoor light fixture broke, and when you live in the country, you really can’t have holes in the outside of your house. Before you know it, you’ll have lots of chipmunks and squirrels cohabitating. They are really cute critters, but unbelievably destructive when they get inside a house. The sewing machine table was the next item on my list, and it wasn’t easy to find a solution. I am extremely short-waisted, and as long as everything was being remodeled, I decided it was time for a new table. To the internet I went. Even the adjustable table legs at Ikea were too tall for my sewing comfort. Each cabinet has 10 drawers – count them – 10 drawers. Hopefully, most of my thread collection will fit into those two cabinets. The cabinets were placed on top of the floor mat I ordered, and sticky pad were placed under the cabinets so they wouldn’t slide off the floor mat. Then onto the table top. 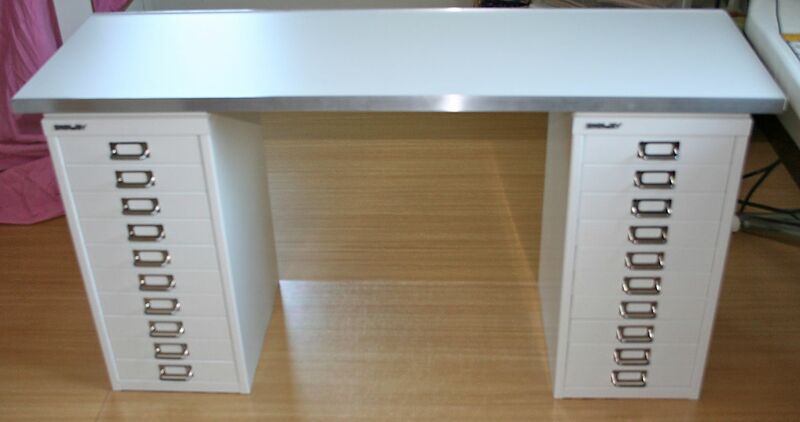 There are two layers of melamine boards on top of the cabinets. The cabinets were expensive, but the melamine board was not. We did buy some sealing tape, so all the edges were nice and white and finished, and it was a piece of cake to attach those. I am happy as can be with this table. It’s the perfect height for me, and it’s adapatable. I can add more cabinets and make it longer, it will easily fit into just about any location, and hold just about any home sewing machine. After spending a LOT of money on a Horn cabinet, that was made totally obsolete when I updated to a larger sewing machine, I decided no more all in one cabinets. Going modular will ensure this set-up can be used for years and years, plus it’s a heck of a lot less expensive. That’s a win-win in my book. My studio is still in process of being set-up, but this morning was the first time since 2009 that I can genuinely say I am totally and completely happy with the changes. This all started in 2009 thanks to TV going from analog to digital. You see I had a little, inexpensive black and white TV in my sewing room, and it kept me company while I sewed. We all know 75% of making anything is spent using a pattern, cutting out fabric, and making design decisions along the way. Well, having the TV on was like background noise for me. I was able to concentrate with the volume turned down low, and every once in awhile, actually watch it for a brain rest. Alas, my sewing room did not have cable. The room next to it did though. I wanted to simply drill a little hole and push a cable through so I could still “watch” TV. Here enters my husband. 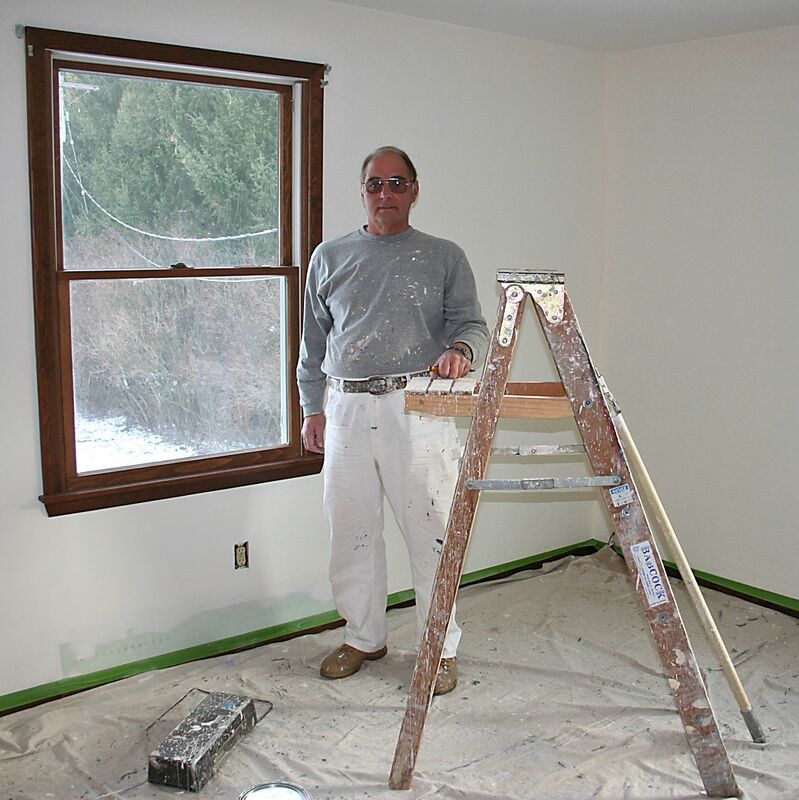 This man is a keeper, but he hates putting anything on the wall, let alone drill a hole in one – you say a hole? In the wall? Yes, drill a hole through the wall. Nope, it was not to be considered. That started my period of discontent, and I didn’t honestly know I was so discontent till this morning. Everything from my sewing room, had to be transferred to the room next to it – which held all my knitting supplies and machines. I sold most of my knitting machines, but packed up one of them, moved the blocking table, and sold off my gravity fed Sussman iron. The room switch was on, but never totally completed. I couldn’t face moving the 7′ shelving, or the plastic containers filled with thread, or the file system containing all my patterns. Plus I had an entire wall for a design wall in my old space. In the other room, there was no space for a design wall at all. Okay, I told myself it was good exercise going from room to room. I told myself I was lazy and didn’t want to face moving so many of my supplies. I told myself stay put and work without the TV, turn on the radio. Nope. The truth was I wanted back in my original room with a working TV, or a total redo in the other room to make it work for me. The total redo in the other room is what happened. I know, I know. How silly was my husband for not drilling a stupid little hole? But you know what? How silly was I for not drilling the hole myself? It was nuts – which I now see. The room really did need a totaly redo. It did have a 38 year old carpet in it. Is it finished? Not yet, but the studio has a new floor, the room is freshly painted, and my cutting table, and one 7′ shelving unit is in place. Bisley 10 drawer cabinets have been ordered as my sewing machine table base, and a simple melamine board will be placed on top. I’ll finally have a table short enough for this short waisted human. And oh yes, there is a TV in place. A new model – tiny – but this one is a color TV. It’s on my 3 drawer plastic storage unit filled with fat quarters. This is the first time since 2009 that I have room for both my sewing machine and my knitting machine to be set-up, and that brings me back to the subject – happiness. I had no clue that I missed machine knitting so much. When I sold off most of my machines after 25 years of selling machines, writing patterns, and hosting knit club – coming up with a demo every month, I was tired. I loved the people, and miss seeing them dearly, but I was burned out. Yesterday I machine knit my first gauge swatch in 5 years. The yarn was too thin for the needle spacing. Today I knit another gauge – two of them. I used the same Egyptian cotton, but this time I plated it with a fine 15/3 silk yarn. Success!!! I came downstairs and felt totally and completely satisfied with the world. That sense of euphoria needed to be examined. What exactly was making me so satisfied? Why did I feel so complete? Why didn’t I recognize what I needed all these years? Don’t get me wrong. I’m a positive, optimistic, hopeful human, but today is the first time in 5 years that I can say that I was happy with my creativity. A place for everything, and everything in its place must be the reason. Organization plays a larger part in my creativity than I thought. My wish is for all of you is to find what makes you happy in your creative endeavors.